Are your kids begging for a pet? Mine are. It isn’t that we planned to be a pet-free family, but we have been for the last few years. Well, not exactly pet-free when you consider the 2 tiny water frogs that we have, but they are extremely low maintenance and don’t bark at all. When my boys were little, we had 3 cats and a dog. They were all acquired early in our marriage, so we hadn’t even thought about needing a pet for the kids! We had plenty. Well, 3 of the pets eventually gave in to old age and the fourth had an unfortunate encounter with a coyote while we were on vacation. It was a lot of drama over a short year. Once we no longer had a pet, it was kinda nice. Leaving home on vacation or all day wasn’t an issue. No more pet puddles or hair all over the couch. But we have come to the realization that if our boys are going to learn to take care of a pet and remember having a relationship with a pet, the window for another pet has arrived. We have been visiting our local animal shelter regularly to see if we can find a good fit for our family. At this point, I am not sure what that looks like which is why we have done a lot of family pet research. 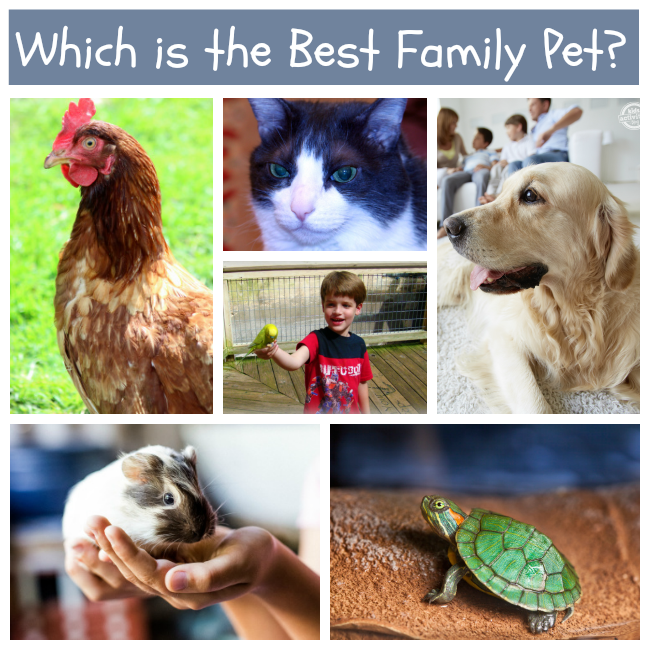 What is the Best Pet for a Family? We thought we would ask our very opinionated Facebook community what they thought was the best pet and we got all sorts of good advice! Depends on families life styles and how committed they are to spending time with the pet. A plastic one that doesn’t need feeding or walking or cleaning out! Guinea Pigs make great pets. They are easy to look after and they live for a long time but not too long that your end up looking after them after they moved out. 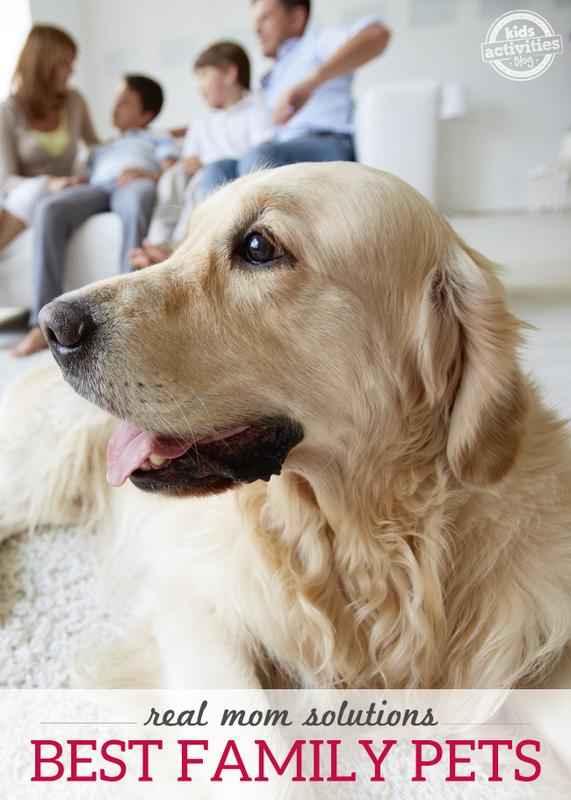 Golden Retrievers… named top dog for families by the Animal Planet. Rats. Do a Google search before you rule them out, they’re awesome pets. Cats – they aren’t high maintenance and they are still cute and soft and if you pick the right one, friendly. It really depends more on the animal itself rather than the kind of pet. Take them to an animal shelter or pet store and see how each animal reacts to the kids. A dog! They teach a child so much. An Old English Sheepdog. They’re a non-hyper puppy, very fluffy so the kids will love petting and hugging him and his temperament is fabulous. Plu,s they don’t usually have tails so you won’t have to worry about kids pulling it. Fish are good too, they calm kids who are hyperactive. Newfoundland dogs are the best family dogs ever! We have a red eared slider turtle. Best pet ever! We have an indoor rabbit. He’s low maintenance. We leave his cage door open and he can come and go as he pleases. Potty trained. I do believe that stuffed animals make GREAT pets, but my kids beg to differ! Cleaning up after them is certainly a breeze. We have had cats and they were good pets – one of them was an exceptional pet because of his friendly and engaging personality. Our dog was an English Bulldog and she was very gentle with the kids, but when excited could knock over a small child accidentally with a simple shift of her weight. The tiny aquatic frogs that we have (affiliate link) have been amazing! We have now had them for 2 1/2 years. My middle son has been in charge of feeding 2x a week. They only take a few pellets of food at each feeding and the enclosed aquarium is self-cleaning. I can’t believe their longevity!